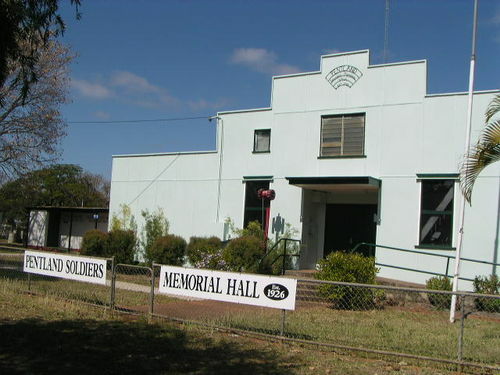 The Pentland Soldiers Memorial Hall was erected in 1926 in memory of those soldiers who paid the supreme sacrifice during World War One. The Soldiers Memorial Hall was officially opened on the 24th April 1926 by Mrs Pilcher who received an inscribed cup from the Pentland residents as a memento of the occasion. Mrs Pilcher was the mother of four sons who had gone to the war with one son paying the supreme sacrifice while recovering from his war wounds in France. Townsville Daily Bulletin, 4th May 1926.